Tamron announced the launch date of three new lenses SP AF28-75mm F/2.8 XR Di LD Aspherical (IF) MACRO, AF28-300mm F/3.5-6.3 XR Di VC and SP AF70-200mm F/2.8 Di all of them are for use with Nikon cameras. Lenses will be launched on May 30 in Japan. 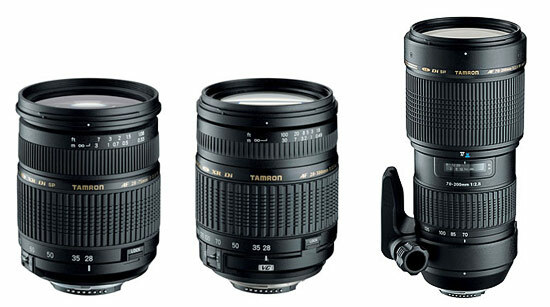 Tamron didn't gave any information about the prices of this lenses. The SP AF28-75mm F/2.8 XR Di LD Aspherical (IF) MACRO zoom lens (Model A09NII) is a lightweight and compact standard zoom lens compatible with 35mm full-size SLR cameras and featuring a fast maximum aperture of F/2.8 that is constant over the entire zoom range. The lens enables the user to enjoy the creative world of SLR photography by boldly exploiting attractive out-of-focus effects peculiar to the fast maximum aperture in portraiture or using high shutter speeds. The optical system designed to optimize the power distribution within the system by the innovative employment of XR (high refractive index) glass elements has realized the compactness while effectively compensating for various aberrations. Four hybrid aspherical elements placed at ideal positions ensure high depictive performance while contributing to downsizing the overall length. In addition, three LD (low dispersion) glass elements deliver high quality images. The SP AF28-75mm F/2.8 XR Di sports the minimum focus distance of 0.33m over the entire zoom range, the closest distance among fast standard zoom lenses in the class. With Tamron's conventional SP AF28-105mm F/2.8 zoom lens, the minimum focus distance changes (0.5m at 28mm/105mm but 0.44m in the 70-85mm range). However, the SP AF28-75mm F/2.8 XR Di retains the minimum focus distance of 0.33m over the entire zoom range thanks to improvements in its optical and mechanical designs. The maximum magnification ratio of 1:3.9 at the 75mm tele end enables you to enjoy close-up photography easily. By the employment of various improvements in its mechanical design, Tamron has successfully packed the complicated lens configuration into a compact body for downsizing the maximum diameter of the lens. In addition, the improved mechanical construction minimizes changes in zooming torque for enhancing operational ease. Hidden improvements are also made from the perspective of manufacturing engineering to enhance the accuracy of parts, realizing the light weight and increasing durability. The lens has a built-in zoom lock mechanism to prevent sliding fall of its barrel when the outfit is carried around. The lens is supplied with a flower-shaped lens hood as a standard accessory designed to efficiently cut harmful light entering from angles other than intended angles at four corners of the frame in order to ensure clear descriptive performance. 1) Two gold-colored metal rings are placed at a key portion of the lens in order to enhance the visibility of the symbol of Tamron's "SP" series. 2) The rubber pattern of the zoom and focus control rings has been changed to a pattern that is denser than the conventional rubber pattern, for better feel and touch in manipulating the lens. 3) Typefaces on the lens have been changed for better visibility. 4) Delicate matt-finish painting is added to the black painting over the lens barrel in order to enhance high quality image. Tamron's AF28-300mm VC zoom lens has been highly evaluated by many photographers the world over since the introduction of the lens in October 2007, as a compact and high power zoom lens providing stabilized viewfinder images. The lens covers an angle of view equivalent to that of a 465mm ultra telephoto lens when mounted on a digital SLR camera equipped with an APS-C size image sensor. The ultra telephoto range is one where Tamron's proprietary VC (Vibration Compensation) mechanism exhibits its compensation performance to the maximum extent. The lens enables the user to enjoy ultra telephotography with amazingly stabilized viewfinder images. The lens covers an angle of view equivalent to 43mm at its wideangle end, allowing the user to respond to a wider variety of scenes than tele-zoom lenses in the 70-300mm class do. The AF28-300mm F/3.5-6.3 XR Di VC (IF) MACRO (Model A20N II) is a compact and high power zoom lens that can be used as a standard zoom lens. It allows not only the users of conventional 35mm film SLR cameras but also owners of digital SLR cameras equipped with APS-C sized image sensors to enjoy comfortable SLR photography of up to 465mm-equivalent ultra telephoto without hand shake. The lens covers everything from 28mm wideangle to 300mm ultra telephoto when mounted on a 35mm full-size film SLR camera and a range of angles of view equivalent to 43mm wideangle to 465mm ultra telephoto* (diagonal angle of view of 5°20’) when used with a digital SLR camera. Tamron's proprietary VC (Vibration Compensation) mechanism exhibits its power particularly in ultra telephotography, allowing the user to expand his/her photographic creativity while enjoying the world of ultra telephotography. Tamron's proprietary VC (Vibration Compensation) mechanism employs a "three-coil" system that is designed to let three coils drive a compensator lens electromagnetically via three steel balls built in the mechanism. Since the compensator lens is supported with rolling frictions of the steel balls, follow-up performance is enhanced while the simple construction realizes the compactness of the mechanism itself. A highly accurate gyro sensor built in the mechanism to detect hand shake delivers comfortable hand-shake compensation performance in combination with a 32-bit RISC CPU. The AF28-300mm Di VC zoom lens is a product Tamron has developed by integrating advanced optical design technology Tamron has accumulated as the pioneer in high power zoom lenses, in order to strike an ideal balance between a vibration compensation mechanism and compactness. The optical system uses XR (high refractive index) glass elements, a GM (glass molded aspherical) element, hybrid aspherical elements, an LD (low dispersion) glass element and an AD (abnormal dispersion) glass element. The optical design designed to provide high definition and contrast performance as well as flatness of the field enables you to respond a wide variety of photographic scenes, as a lens designed by eyeing characteristics of digital SLR cameras. The AF28-300mm Di VC sports the minimum focus distance of 0.49m over the entire zoom range, the top class capability among high power zoom lenses compatible with 35mm full-size SLR cameras. The maximum magnification ratio of 1:3 at the 300mm telephoto end is also the top class capability. Tamron employed multi-layer coatings on lens elements for reducing reflections on lens surfaces as well as internal surface coatings (coatings on cemented surfaces of lens elements) in order to minimize reflections from the imager itself within the mirror box, a problem inherent to digital SLR cameras. In designing the lens, Tamron thoroughly reviewed roles of respective barrel components in order to make it as compact as possible. As a result, the increase in the overall length of the new model is confined to 17.8mm and 5mm in the maximum diameter compared to the conventional AF28-300mm (Model A061), despite the VC mechanism now incorporated. The SP AF70-200mm F/2.8 Di LD (IF) MACRO (Model A001N II) was developed under the same concept as the SP AF28-75mm F/2.8 XR Di (Model A09)?a lens highly evaluated by many users around the world as a compact and fast zoom lens boasting a high cost/performance ratio. The 70-200mm is a fast F/2.8 zoom lens that is compatible with full-size SLR cameras and covering an extended telephoto range. While preventing the lens from becoming bulky, Tamron successfully realized the minimum focus distance of 0.95m over the entire zoom range for a maximum magnification ratio of 1:3.1 at 200mm. Combined with the advantage of an internal focusing system, this lens enables the user to enjoy stress-free close-up photography. The SP AF70-200mm F/2.8 zoom lens covers a focal length range from 70mm medium telephoto to 200mm real telephoto when mounted on a full-size SLR camera while covering a 35mm-equivalent focal length range from 109mm to 310mm ultra telephoto* (diagonal angle of view of 7°59’) when used with a digital SLR camera equipped with an APS-C sized image sensor. Tamron has realized the minimum focus distance of 0.95m (in.) over the entire zoom range for the first time in the class of F/2.8 fast tele-zoom lens compatible with 35mm full-size SLR cameras. The maximum magnification ratio at its 200mm tele end is 1:3.1. As a result of the thorough pursuit of ideal power distribution within the whole optical system, the lens accepts popular 77mm filters. In order to strike a balance between the capability to derive soft out-of-focus effects and sharpness for acknowledging Tamron’s tradition, the lens makes lavish use of as many as three LD (low dispersion) glass elements for minimizing on-axis and lateral chromatic aberrations which become major image degradation factors. Thanks to this innovative optical design, the lens realizes high definition and high contrast performance as well as optimum flatness of field, providing outstanding optical performance in all photographic situations and over the entire zoom range. Tamron has realized the light weight of 1,150g ( oz.) for the F/2.8 fast tele zoom lens by using in its barrel parts made from engineering plastic materials having superior dimensional stability and strength even sufficing conditions for industrial applications. Tamron employed multi-layer coatings in order to reduce reflections on lens surfaces as well as internal surface coatings (coatings on cemented surfaces of lens elements) in order to minimize reflections from the imager itself within the mirror box, a problem inherent to digital SLR cameras. Since the lens employs an internal focusing system, the focus control ring of the lens (in all mounts for Canon, Nikon, Pentax and Sony AF SLR cameras) does not rotate at time of focusing or zooming, providing good holding and balance in all photographic conditions in the AF mode, while focusing can be smooth and accurate in the MF mode just like a manual focus lens. 6. A lightweight, detachable and durable tripod grip ring made of aluminum is supplied as a standard accessory.